So today was kind of back to normal at my house. The older boys were sent back to school, and the little one went to preschool. But I think we are all going to need a few weeks to get over whatever bug we caught! I didn’t get much done on any of my projects, but I did finish up some Etsy orders that needed to be fulfilled and sent them on their merry way! So I guess there is that, but alas I did not finish my valentines give away yet. I know at this point I have been talking about it, probably, for over a week and I apologize for the build-up, because it might disappoint in that area! But it is a cute giveaway so hopefully you will be as excited about it as I am. Anyway, back to the reason for my post. I found this sweet little suitcase at a local shop before Christmas and fell in love. I haven’t seen a red and cream one this size before, so I snatched it up right away (and the price was really good too)! But as soon as I got her home I had a hard time finding a spot for her to live. I don’t like a lot of clutter, and every spot she went, I just didn’t like. So here is my dilemma, because I haven’t found a good living spot for her, should I sell her, or should I keep trying to find one, because I can’t stand to let her go. What do you think? Should I keep it, or sell it? I know which way mine husband would vote! 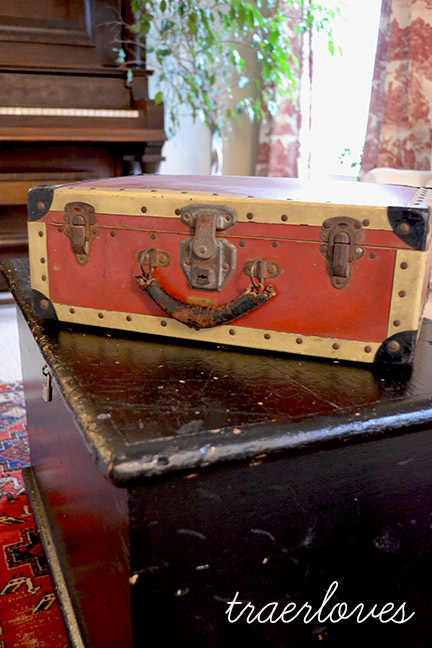 A friend of mine had a small collection of old suitcases and stacked them inher dining room. It looked cool. You know me, I vote to save EVERTHING.